Our babies occupy two rooms, each of which offers a staff-to-child ratio of 1:3. 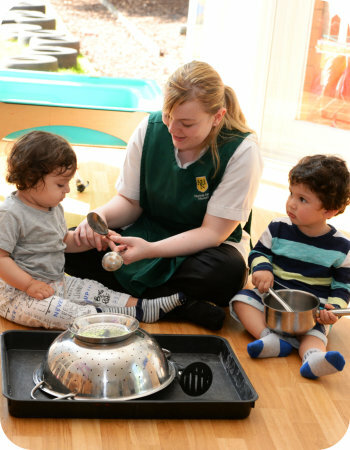 They are staffed by fully trained Nursery Nurses who are overseen by an experienced Room Leader supported by Senior Nursery Nurses. Our small group sizes help to ensure that a child’s individual needs are met. Each child has a designated Key Person with whom they form a special bond of attachment, ensuring that they feel happy and safe in their environment. We know that when a child’s physical and emotional needs are met they are more likely to take advantage of the learning opportunities available. Play is an important element in your child’s learning journey. The Key Person will observe them closely in order to ascertain their particular interests and stage of development, and thereafter provide play opportunities through activities which are variously spontaneous, focused, comforting and challenging. Your child’s developmental progress is closely monitored on a daily basis and great emphasis is placed on fulfilling their individual needs.